MAN and PSA Group revealed details of their standard pre-made LCV chassis cab conversions. The MAN Vans To Go scheme is based around its new TGX van chassis. The Ingimex-made dropsides measures 4,300 by 2,100mm; the Ingimex tipper is 3,270 by 2,100 mm. The Luton, made by bodybuilder JC Payne, measures 4,250 by 2,085mm. PSA Group also launched a similar range for the Peugeot brand called ‘Built for Business’, which complements a ‘reshaped’ decade-old offering from corporate sister brand Citröen. JC Payne also makes both brands’ tippers, dropsides and Lutons, but low-floor Lutons come from Lincoln Commercial Bodies (for Peugeot) and Trucksmith (for Citröen). In addition to these standard models, which are sold from stock at a standard list price, the OEM has also validated another eight-odd converters to build other vehicle varieties. Also exhibiting at the show, Ingimex presented new VW Transporter bodies (tipper or dropsides), currently awaiting type approval. Meanwhile, a new, lighter chassis design specifically for conversions of PSA Group back-to-backs and Luton boxes from Mark Harris was previewed by Al-Ko Kober, although those on stand did not use the new design. In hall 3, Paneltex showed a refrigerated body on the third generation Mercedes-Benz Sprinter chassis cab that is launching in the UK later this year. The triple-temperature body is side-loading, requires no step and features an air deflector. Turning to telematics news, PSA Group finance operation Free2Move launched a low-cost, web-based telematics system, Free2Move Connect, based on the installation of a new wired black box. At the most basic level, this includes remote monitoring of fuel consumption and mechanical alerts; additional options include driving style and geolocation. Texa’s eTruck, a module that plugs into the vehicle OBD port, and which also launched at the show, offers remote monitoring of vehicle status by app, with tailored screens for drivers, fleet managers and workshops. For workshop technicians, a group of camera headsets is currently in a six-month trial among 10 Volkswagen CV dealers. Demonstrated at the show, the kit, which includes a torch, camera with zoom, noise-cancelling headphones and four microphones, connects technicians to its Milton Keynes headquarters, helping speed up resolution of tricky technical problems and preventing the need to send a member of staff direct to site. “It is really working for us right now,” says Paul Anderson, service operations manager. Maintenance system provider r2c’s own headset, Smart Inspect (pictured above), seems to focus more on data input (as in its Exemplar workshop management software). The headset features voice recognition and recording software, enabling dictated notes to be transcribed to electronic records. It also offers video sharing through a Wifi connection. Elsewhere, TruTac presented a new view to its telematics and driver management software, an Earned Recognition summary dashboard that presents live and historical data of compliance to each of the DVSA scheme’s KPIs. Each is clickeable, enabling users to dig into an instance of non-compliance, to investigate what exactly went wrong. This feature is free for existing customers. An alternative system for Earned Recognition was demonstrated on the FTA’s stand. Rather than offering an all-inclusive fleet management package (such as its own Vision system), the ER Hub works with other maintenance recording systems to push through the summarised data, calculates the KPIs and automatically sends the data to DVSA by email. At the time of the show, the system was in alpha testing. Pricing had not been agreed, but it will be available to non-members. Electric vans were another theme. LDV showed off its 100kW EV80 (claimed NEDC driving cycle range: 120 miles), which it reports is being taken on as a demonstration by Royal Mail in May, while furniture retailer Ikea has received two vans that it is using at its Exeter store. Also, a pre-production left-hand drive version of the Volkswagen e-Crafter was on show. A 100-mile range is claimed from a 100kW body-mounted lithium-ion battery. Payload is 1t in the 3.5-t model. Meanwhile, Nissan has increased the battery size of its NV-200 from 24 to 40kWh, the result of which is a boost in range, from 106 to 174 according to NEDC, or to about 124 miles on the WLTP cycle. Payload is 705 kg in a 4.2 m3 cargo volume. 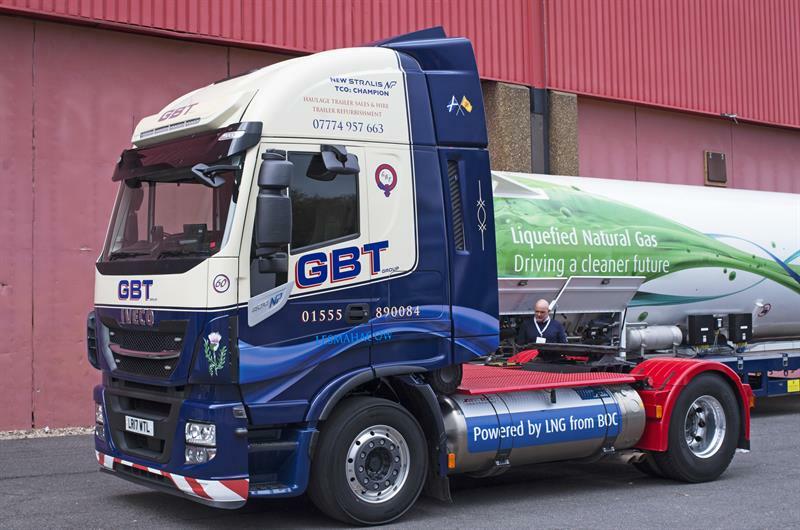 A low-carbon retrofit alternative comes from Tribune Group and involves strapping on a 44-l LPG tank to a tractor. The Alchemist dosing system injects a small amount of LPG gas into the conventional, unmodified engine’s air intake, pre-turbo. Alchemist claims that a 5% injection of gas yields a 15% fuel reduction, thanks to improvement in combustion of otherwise unburnt diesel. The system recently passed VCA type approval for LPG systems and final track testing is scheduled in a few weeks’ time. Innovative trailers also got an airing. Cartwright showed a prototype of a double-deck trailer with lifting roof (pictured below), said to be about to go on road trials. While the lower deck is being loaded (at internal head height of 1.88m), the moveable roof extends, along with the upper deck, to a maximum height of 4.88m. Once finished, the roof drops down, to overall height of 4.5m (internal height: 1.54m). It can accommodate 95 cages, rather than 75 at this travel height, which is claimed to reduce fuel consumption by 5%. 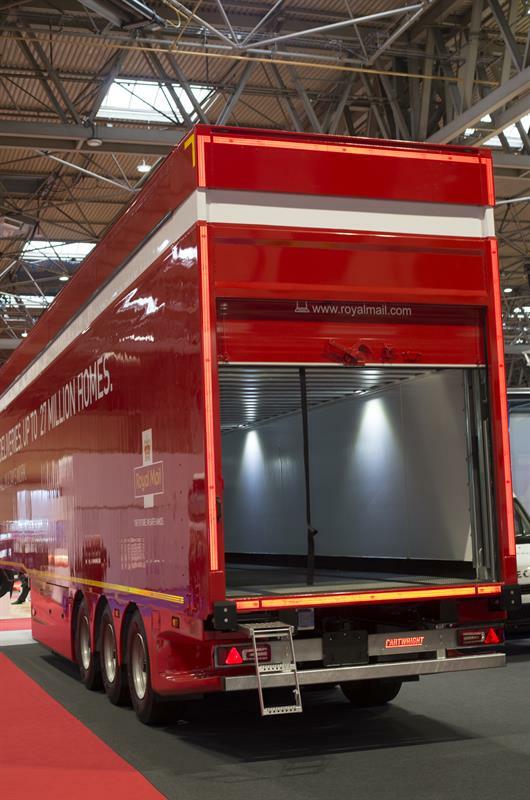 SDC’s new hydraulic lifting deck curtainsider offers storage for 52 pallets. Unusually, its height is not fixed at the midpoint, but can be set at 120mm intervals, thanks to studded vertical columns that support a horizontal pin. Don-Bur’s EBS-Safe warning system alerts drivers who fail to adequately connect the ABS/EBS line from tractor to trailer. Telematics data revealed that one blue-chip haulier had up to 36 incidents a week when the legally-required trailer EBS connection was either faulty or non-existent. A similar Leg-Safe warning system alerts drivers who fail to lower a semi-trailer’s landing legs before they drive off, causing it to crash to the pavement.